Crimson Trace MVF-515R MVF-515R Modular Vertical Foregrip Red Laser for ARs FREE SHIPPING! Always pushing the boundaries of innovation, Crimson Trace has set a new standard for tactical accessories with the MVF-515R Modular Vertical Foregrip Red Laser for ARs. The modular upgrade combines three tactical attachments into one powerful package, transforming any duty AR style rifle into an unstoppable, combat-ready weapon. In combat situations mobility is key. The aircraft-grade aluminum foregrip provides the increased range of motion, superior control and faster follow-up shots needed to get in and get out in a flash. Designed to offer a strategic advantage in any tactical situation, the modular attachment features an integrated red laser sight and 200 lumen LED. Ambidextrous activation panels allow users to trigger both light sources independently or at the same time. 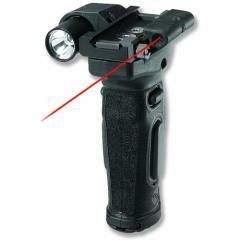 The blinding LED strobe feature can be used to disorient targets at close range, or place shots with lightning precision from afar using the red laser sight. ©2002-2019 CopsPlus.com: Crimson Trace MVF-515R MVF-515R Modular Vertical Foregrip Red Laser for ARs FREE SHIPPING!